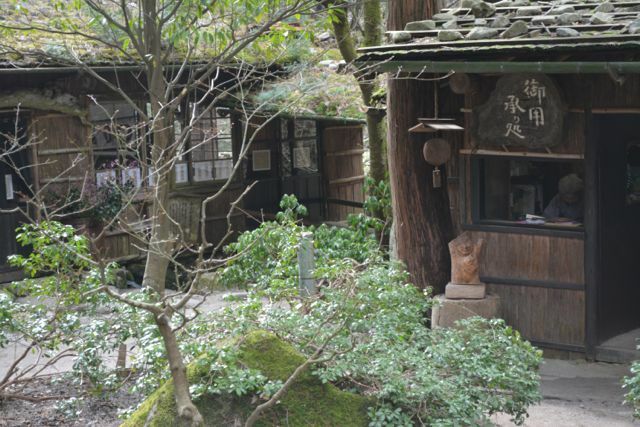 Recently I visited Mitaki-en, a cosy restaurant complex in a magical forest setting near the beginning of Therapy Road, not far from the town of Chizu in Tottori Prefecture. 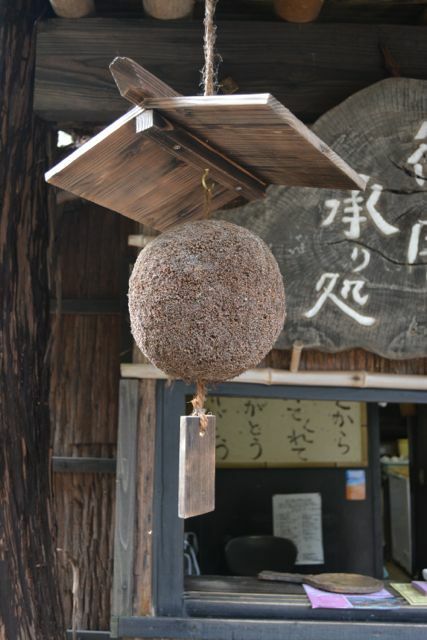 I spotted a wooden ball covered by its own little wooden roof hanging under the eaves. A Japanese friend, Natsuki from Tottori city, told me that it is called a ‘sugi-dama’ or ‘cedar ball’, made from cedar needles and twigs, and symbolising hope and peace. Further research has revealed that sugidama are also known as sakebayashi because in years gone by sake makers would hang a fresh green sugidama at the entrance to their brewery in November or December, right after the first sake from the new rice harvest had been pressed. Several months later when the sugidama had turned brown, customers would know that the sake had aged and was ready to drink. 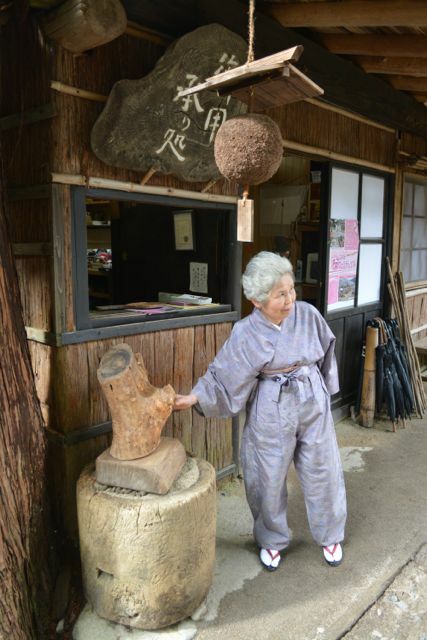 The town of Chizu once had a flourishing cedar wood industry. Today sugidama are still made there; here’s a link to a workshop you can attend to try your hand at making one. If you are keen to see how they are made, check out this website – although the text is in Japanese, the photos show step by step the detailed process of making a sugidama. Please visit my Etsy store to purchase vintage and antique Japanese treasures. Would you like to sign up for my monthly newsletter? I was looking for information on an artists when I came across your blog on all things Japanese, it is all very interesting. My painting is by the artist Takahiko Mikami and is of a blue/purple horse, it was painted in 1964 for a lady called Bettina who I believe travelled with her husband to various posting in embassy’s around the world.